Jane Dixon and Dudley Adam toured with Walk With Jith in May 2011. The video is on top is made from photos of a leopard hunting a wild boar, taken by Jane Dixon during the tour. This is a photo tour report with a comment on the tour. 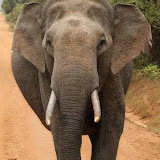 We spent 1 week in southern Sri Lanka at Yala NP and Sinharaja Forest Reserve in May 2011. Our guide, Nandana, was wonderful - he explained the culture of Sri Lanka and was well versed in the wildlife and natural history of Sri Lanka. We spent 3 full days in Yala undertaking full days safari drives from 6.30am to 6pm in the evening. The birds, mammals, reptiles and butterflies were numerous. We saw some amazing behavioural moments while just sitting and watching. The most memorable was the leopard launching an attack on a wild boar herd, subsequently catching and killing one of the baby wild boars. The incident was dramatic and I never expected to see the aggressive response with which the boars tried to fend off the leopard. We also saw water buffalo chasing away a leopard, a ruddy mongoose digging up and wrestling with a land monitor, and a mongoose desperately trying to work out how to catch a 2m Sri Lankan python. Birds were also numerous and we saw plenty of endemic species. After leaving Yala we drove to Sinharaja Forest Reserve, a completely different habitat to that of the dry, rocky, shrub-filled Yala. We did a couple of morning walks through the forest. Rain prevented afternoon expeditions. Seeing green pit vipers and Sri Lankan frogmouths were amongst the highlights. However, the icing on the cake was our guide finding the Serendip Scops Owl in the depths of the jungle. Braving leeches and bogs, we had a fantastic view of this recently discovered for nature species. We would definitely recommend Walking with Jith tours of Sri Lanka.